Andrew Nishihara of Leilehua was one of many shooters to put some rounds down the range in the kneeling portion of the state air riflery championships at the Blaisdell yesterday. The difficulty of air riflery can be proven by all of the former champions who have failed in repeat bids. Since the first state tournament in 1999, no shooter has ever won individual titles in consecutive years. 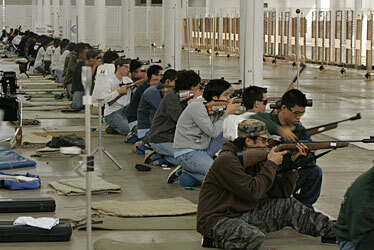 That trend continued yesterday as defending state champion Jordan Muratsuchi of Mid-Pacific finished 11th in the boys competition of the Civilian Marksmanship Program Air Riflery State Championship at the Blaisdell Center Exhibition Hall. Saint Louis senior Christopher Lam edged Punahou's Davin Lee by two points to win the boys title, while Punahou's Meilin Jia-Richards took home the girls crown. The rarity of repeat champions does not hold true in the team standings. Lee and Nigel Kojimoto led Punahou to its third consecutive boys team championship, while Sacred Hearts won its second straight girls title. "Some of it has to do with how they handle the pressure of being No. 1," Punahou coach Karen Finley said. "More of it has to do with other kids pushing themselves to be just as good." Finley coaches both the boys and girls for the Buffanblu. Her girls team challenged Sacred Hearts all the way to the end, but was eventually defeated by 11 points. "Both Karen (Finley) and I were biting our nails because the scores were so close," Sacred Hearts coach Alan Tokumura said. "We knew if our team got hot that we could beat any of the other teams." Eight of the top 10 finishers in the girls competition were either from the Buffanblu or Lancers. Mai Oseto led four Sacred Hearts finishers in the top six with a second-place score of 531, but it was no match for the 538 shot by Jia-Richards. "It was the highest score I've ever had in a match," Jia-Richards said. "I just tried not to think at all." The Buffanblu boys team edged Waiakea by 22 points to claim the title, but it didn't come without some suspense. During the kneeling portion of the event, the top two thumbtacks of Lee's target fell off, causing his target to fall forward at an angle. Once a shooter begins firing his shots, he is not allowed to adjust the target, no matter what the circumstance. Despite the bad fortune, Lee still managed to tie teammate Chris Han for the highest kneeling score with a 183. "If I can pull away a score like that with what happened, then it's all good," Lee said. "I just had to stay focused." After the initial prone-position stage, Muratsuchi was tied for the lead. He had a five-point lead over Lam after the standing stage, but the Crusaders shooter answered with a 179-point kneeling score to finish 11 ahead of the defending champion. "My score today was pretty good, but it wasn't as good as last year," Lam said. Lam finished in fourth place last season with a score two points higher than his title-winning score this year. He was also at a minor disadvantage as the only Crusader in the state tournament. Every other finisher in the top 10 had an entire team to back him up, but Lam was out there on his own. "It was a bit intimidating, but I had friends both at school and here that supported me," Lam said. "I didn't let any outside factors get in the way."